Red hot demand for properties all over San Francisco has set housing costs skyrocketing all over the city, and perhaps nowhere is the frenzy for housing more obvious than the Mission District. That’s why some longtime residents have lobbied hard for a moratorium on market-rate building in that neighborhood. The 18-month pause on building, or Proposition I, appears on the San Francisco ballot next week. Would halting the supply of housing preserve affordable properties and stem displacement in that neighborhood? Not necessarily, experts told NBC Bay Area. “What we need is new housing,” said Ralph McLaughlin, a housing economist with real-estate website Trulia. “And so, at least at a superficial level, if we are saying, ‘Let’s stop building housing,’ that is not going to make things more affordable,” he added. In other words, halting the supply while the demand continues to grow could only make matters worse. He says market rate, or privately-produced housing, is a significant source of funding for affordable housing. “Developers either build a certain percentage of their units on site as affordable, which is good because it creates [affordable] units, or they pay a fee which then goes into building affordable housing in San Francisco,” he said. 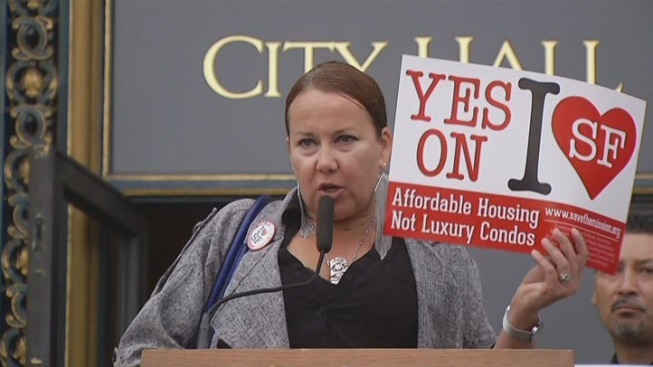 Proponents of the measure, like Fernando Marti, Co-Director of the Council of Community Housing Organizations, say that the proposition is a much-needed time out while city leaders look for a solution that works for everyone, new and longtime residents. “We’re going to pause to figure out where we’re going to build this housing, and how we’re going to create a balance, and if we need rezoning and other tools,” he said. Research shows the Mission is swiftly changing, but it’s not necessarily new building that is driving up prices there. In 2014, about 3500 new units were built in San Francisco, but only 75 of those went up in the Mission. All sides of Prop I want to see more affordable housing in the Mission, there’s just some disagreement on the best pathway to get there. For CCHO’s Fernando Marti, it’s ultimately less about halting building and more about halting the displacement that has plagued the city’s oldest neighborhood.